“More guns, more violence”, so goes the mantra that, apparently, many liberal politicians and their voters keep chanting. In one way, it sort of makes sense, if you think about it without considering anything else other than the number of guns. However, there were some maps made by the United Nations office on Drugs and Crime that tend to set this mantra on its ear. Remember, now; this is data from the UN, not some conservative think tank. The map shows that where gun ownership is higher, the number of homicides is, generally speaking, lower. In most cases, where the country is orange or red on the gun ownership map – the high end of the scale – they’re green on the homicides map, meaning the low end. Places like the US, which no one would deny is awash in guns, to those places in Europe where you can still get them, more guns mean fewer homicides. And all these values are population based; per capita. And to just reinforce the point, when the country is green on the gun map – where it’s difficult to get guns – you’re extremely likely to see red on the homicide map; one might say figuratively and literally. Fewer guns in Central and South America, Africa and Russia don’t translate into rainbows and unicorns, unfortunately. It’s time to stop chanting and take an honest look at the facts. The unicorns might just be grazing in another field entirely. When the minimum wage goes up, low-wage jobs are lost. This isn’t a prediction, it’s an observation. The Wall St. Journal notes it’s happening again, at the worst time for it, and mostly for minorities. Syria pulled out of the running for a seat on the UN Human Rights Council. The problem is that they pulled out rather than being pushed. Given the number of human rights violators on that council, they could have easily been approved. "I am a scientist who was on the carbon gravy train, understands the evidence, was once an alarmist, but am now a skeptic." Read why here. The headline says it all: "WikiLeaks Threatens Its Own Leakers With $20 Million Penalty If They Leak Elsewhere". Transparency for thee but not for me. Green energy losing green: A solar farm in Texas is losing money because the property taxes are so high. High-speed rail losing speed: "California’s much-vaunted high-speed rail project is, to put it bluntly, a train wreck." Of course, the solution, according to the LA Times, is do it over, throwing good money after bad ($43 billion of bad money). What a shock! "Autotrader survey shows most motorists go green to ‘save money, not the environment’." Make green energy affordable, and the world will beat a path to your door. A big reason health care costs are rising so fast is because of central planning (aka Medicare, Medicaid). The Democrats solution? More central planning. Civility Watch: Wisconsin Attorney General releases 100 pages of threats against lawmakers during the budget battle. The White House shut out a reporter from the Boston Herald because of a critical editorial that the Herald put on their front page. The issue with Obama is not Fox News; it’s anyone who disagrees with him. But if you didn’t know about this, it’s not your fault. The rest of the media, who you’d think would be all over this treatment of colleagues, were virtually silent on the matter. The anti-war crowd has seemingly melted away into the woodwork with the election of President Obama. I mean, if George W. Bush had violated federal law by invading a country without, within 60 days, getting congressional approval, how loud would the outcry have been, from the Left and the Media? Instead, a collective yawn. Question: What government program costs us 7 times what NASA does? Answer: The department of Improper Payments. Question: In a study looking at data from over 50 years, towards which political party does the NY Times lean? Answer: Well, do you really have to ask? And it’s more about what stories are covered than about bias within stories. Question: Why do movements like pro-democracy or the Tea Party seem to balloon overnight? Question: What are 5 truths about Planned Parenthood that you’re not likely to hear in the media? Question: How could you defend the use of sola Scriptura, "Scripture alone", to someone who objects on the basis that humans are fallible, so you just can’t be sure what is Scripture? Answer: C. Michael Patton has a good response. Question: Has Paul Krugman ever flip-flopped on an issue for politics’ sake? Not a little quibble, but on really substantial stuff? Answer: Oh yeah, he has. Question: Has Nancy Pelosi ever flip-flopped on an issue for politics’ sake? Answer: Well, she blamed high gas prices on "two oil men in the White House" before. Wonder who she’s blaming now. Question: Is Syria, a country that is killing its own citizens for protesting the government, really being considered for a seat on the UN Human Rights Council? Answer: Oh yeah, it is. And the UN is divided on whether it should even investigate their recent human rights abuses. Question: Was Stanley Ann Dunham punished with a baby. Answer: No, the baby (Barack Obama) was not a punishment, even though Barack’s campaign rhetoric would tend to suggest otherwise. Question: Has Hamas moderated, since it had to take on political leadership and run the Palestinians? Answer: Oh no, it hasn’t. Question: Did Fox News push the whole "birther" issue the most? Answer: Oh no, they didn’t. Question: Does Europe want us Yanks, with our neo-con aggression, out of their backyard? Answer: According to this Norwegian liberal, oh no, they don’t. 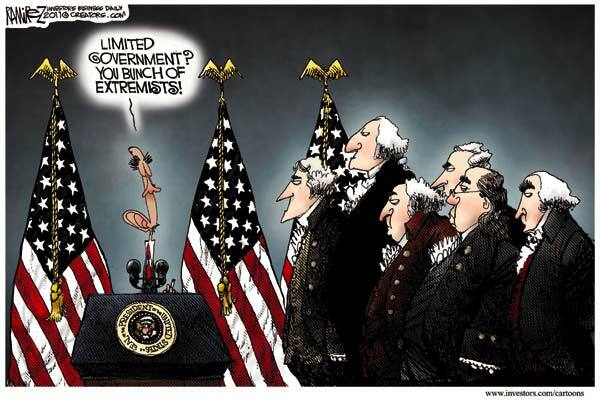 Question: Shouldn’t the federal government be a limited one? Answer: Click for a larger image. …of Libya’s Human Rights record, such as it is. The U.N. Human Rights Council has postponed consideration of a report that praises Libyan leader Muammar al-Qaddafi’s government for its human rights record. The report was written several months before the uprising in Libya — which has pitted Qaddafi, as well as armed loyalists and mercenaries, in a violent battle against his own people. But it was nevertheless scheduled for consideration and a vote on March 18, even as the U.N. General Assembly voted Monday to suspend Libya from the Human Rights Council. Because everything was pretty good in Libya under a 40+ year dictator until just a couple weeks ago. Look, real human rights are the result of an underlying belief in the principle. If, at the drop of a hat, you’re dropping bombs on your own people, they never really had human rights to begin with; just a convincing façade. Unrest in the Arab world. Autocrats killing their own people. Hezbollah working with Mexican drug cartels. And what’s the UN most concerned about? Israel. Right. Meryl Yourish has more. The inverted morals of the Left; killing babies is OK, but circumcising them once their born should be against the law. Even if you’re Jewish. The headline reads, “Gaza militants fire missile at Be’er Sheva for first time since Gaza war”. Technically correct, but Qasams fall there virtually daily, but you wouldn’t know from our news media. The Left is still pushing the meme that “right wing ‘hate’ groups” and their uncivil rhetoric caused the shooting of Rep. Gabrielle Giffords. Civility Watch: The uncivil discourse has not been just in Wisconsin. Nazi imagery and racial slurs have been used in protests around the country, most recently in Massachusetts, Washington, DC, and Colorado. And while fully documented, none were mentioned by the media. Think it may have something to do with the fact that the protests were all for liberal causes? In order to find that the ObamaCare individual mandate is constitutional, a judge had to somehow equate action with inaction. The result was never in doubt, it’s just how to get there that is the issue for these liberal judges. CNN’s Candy Crowley put on her rose-tinted glassed once Obama was elected. I mean people were burning Bush in effigy for the previous 8 years, and now people love us. Donald Rumsfeld disagrees, and Lori Ziganto has evidence to the contrary. It’s official: The State Department supports expelling Libya from the UN Human Right Council. Where in the world were these guys when Libya was put on the UNHRC? Back in May, we just called the HRC “flawed”, which may be last year’s biggest understatement. In fact, it’s the whole UN that is flawed. And finally, oh, that liberal media. A comparison of Tea Party protest coverage, and union protest coverage. Love that independent, unbiased media. Venezuelans are getting tired of the food shortages, the electricity shortages, the soaring crime, the deep recession (i.e. everything that comes part and parcel with socialism) and have started taking back the country, starting with last weekend’s elections. American voters are poised to do the same in November. The "humanitarian crisis" in Gaza is apparently mostly about symbolism, false narratives and propaganda. Flotillas are required to keep up the narratives. The United Nations will appoint an Earth contact for aliens. No, really. "Mazlan Othman, the head of the UN’s little-known Office for Outer Space Affairs (Unoosa), is to describe her potential new role next week at a scientific conference at the Royal Society’s Kavli conference centre in Buckinghamshire." Doesn’t it strike anyone as unintentionally humorous that "Unoosa" sounds like some alien specie you’d see on "Star Trek"? When the Bilderbergers met last June (cue paranoid music), one of the topics they discussed was Global Cooling. No, really. (Al Gore was apparently not invited.) But indeed, global cooling, were it happening, would be worse than global warming. Crops, for starters, kinda’ like the heat. Tea Partiers uncover rampant voter fraud in Houston. Would it surprise you if I said that most of this was related to a former SEIU employee’s voter registration group? Yeah, me neither. "Scientists have invented an efficient way to produce apparently safe alternatives to human embryonic stem cells without destroying embryos…." They start with ordinary skin cells. As Glenn Reynolds would say, "Faster, please." A couple of encouraging pieces recently regarding the abortion issue in American and the world. First, Ramesh Ponnuru notes that 2010 looks to be the Year of the Pro-Life Woman. Having little to show for itself in Washington, DC, the pro-life movement is getting some allies. Two pro-life women won Republican nominations for the Senate this week. A Tea Party favorite, Sharron Angle, and the former Hewlett-Packard chief executive Carly Fiorina are running for the Senate from Nevada and California, respectively. A third pro-life woman, Susana Martinez, became the party’s nominee for governor of New Mexico, and a fourth, Nikki Haley, a South Carolina state legislator, is expected to be a gubernatorial nominee in her state. If they win their primaries, Kelly Ayotte, the former attorney general of New Hampshire, and Jane Norton, the former lieutenant governor of Colorado, will also be pro-life Senate candidates in November. None of these candidates is a single-issue pro-lifer. But these women have not been shy about discussing the issue, either. Neither Ms. Fiorina nor Ms. Haley would have been likely to get Ms. Palin’s endorsement — valuable in a Republican primary — without firmly opposing abortion. Likewise, Ms. Angle would not have been able to unite populist conservatives and beat the party establishment’s candidate had she been pro-choice. Why this is happening is seemingly paradoxical, but read the whole thing for his excellent analysis. In other news, the United Nations is having trouble forcing the issue overseas. Seems its reasons for funding abortions worldwide has fallen apart under scrutiny\. Deep divisions with top United Nations (UN) officials and abortion activists on one side and maternal health researchers on the other became public this week during the Women Deliver 2 conference in Washington DC. The dispute threatens to derail hopes of raising $30B for family planning at international development conferences in the coming months. These include the Group of Eight summit this month and the UN High Level Millennium Development Goals (MDG) Review in September. The medical journal The Lancet published a study in April refuting UN research claiming 500,000+ annual maternal deaths has remained unchanged for decades. The new study put the figure at 342,900 with 60,000 of those from HIV/AIDS, and said the number has been declining since 1980. Scientists flatly refused to back up the 20 year-old claim by UN agencies and activists that family planning improves maternal health. The Guttmacher Institute’s president, Sharon Camp, asked Murray whether his study’s finding linking declining global fertility rates to better maternal health supports the idea that more family planning will reduce maternal deaths. Murray replied that "there is no scientific way to prove that." Scientists also undercut UN staff’s use of the world’s slow progress toward MDG 5 as a basis for urgent pleas for family planning funds. Boerma and Murray both said that its aim of reducing maternal deaths 75% by 2015 was unrealistic since it was not based upon "historical trends." The world would need an 8% annual drop, whereas 4% has been the best so far. Downplaying the remarks, Guttmacher’s Camp defended a joint Guttmacher-UNFPA report which was based on the now discredited UN figures, and which calls for a doubling of family planning funds in order to reduce maternal deaths by 70%. Camp did not explain why the same amount of funding would be required for a smaller overall reduction. Leftists have so much pull at the UN, and hence big (really big) government solutions have been all the rage. It’s just that their appeal to science has pretty much failed. Of course, that doesn’t mean they’ll stop pushing their agenda, but it’s interesting to hear this from liberals who accuse conservatives of being anti-science. The United Nations atomic agency has lost confidence that the Persian Gulf country is telling the whole truth about its nuclear program and isn’t hiding additional secret facilities. Iran’s Qom enrichment facility, revealed in a Sept 21 letter, “reduces the level of confidence in the absence of other nuclear facilities under construction and gives rise to questions about whether there were any other nuclear facilities in Iran which had not been declared,” the International Atomic Energy Agency said today in a 7-page report obtained by Bloomberg News. This just in: Governments that rig the election system to make sure their hand-picked guy gets elected, and have genocidal designs on other countries can’t be trusted. United Nations shocked. A couple of recent articles demonstrate just how off-track this august body has become. First, an opinion article from USA Today that speaks out against UN efforts to criminalize the criticism of religion. This is as clear-cut a free speech issue as you can get, and the cure is worse than the disease. Thinly disguised blasphemy laws are often defended as necessary to protect the ideals of tolerance and pluralism. They ignore the fact that the laws achieve tolerance through the ultimate act of intolerance: criminalizing the ability of some individuals to denounce sacred or sensitive values. We do not need free speech to protect popular thoughts or popular people. It is designed to protect those who challenge the majority and its institutions. Criticism of religion is the very measure of the guarantee of free speech — the literal sacred institution of society. Gender is not synonymous with women but rather encompasses the social constructions that underlie how women’s and men’s roles, functions and responsibilities, including in relation to sexual orientation and gender identity, are defined and understood. This report will therefore identify the gendered impact of counter-terrorism measures both on women and men, as well as the rights of persons of diverse sexual orientations and gender identities. As a social construct, gender is also informed by, and intersects with, various other means by which roles, functions and responsibilities are perceived and practiced, such as race, ethnicity, culture, religion and class. Consequently, gender is not static; it is changeable over time and across contexts. Understanding gender as a social and shifting construct rather than as a biological and fixed category is important because it helps to identify the complex and inter-related gender-based human rights violations caused by counter- terrorism measures; to understand the underlying causes of these violations; and to design strategies for countering terrorism that are truly non-discriminatory and inclusive of all actors. Emphasis mine. Is the UN really unaware of biology? No, they’re just trying to bend it to their will in order to mainstream behaviors that they deem okey dokey. This is way beyond a big diplomatic table where nations can work out their differences. As with any political body, they expand to fill any area they wish, not being otherwise constrained. This is a body badly in need of remaking from the ground up. Who’s Watching the (Racism) Watchers?